This is Armenia in 1921, a few months after the Bolsheviks took power. This is not a part of a folded letter but an entire letter: to economise paper, the sender has used only half a sheet. 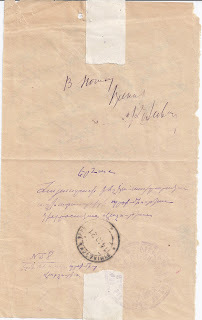 His (probably his) signature and maybe a second signature (as is common on official communications in the early Soviet period) is at the bottom right of the message. My guess is that this is an educated person writing, able to handle a steel pen to write neatly in this small Armenian red script. Top left you can see that this is N. 58 in a series of communications, written on 10th October 1921. There is a N. 515 at the top dated 20 X 21 in a different ink and a No.16 to the right, in yet another ink. Someone has pencilled across the letter in pencil in Cyrillic. I guess that all three of these notes were applied at the destination. 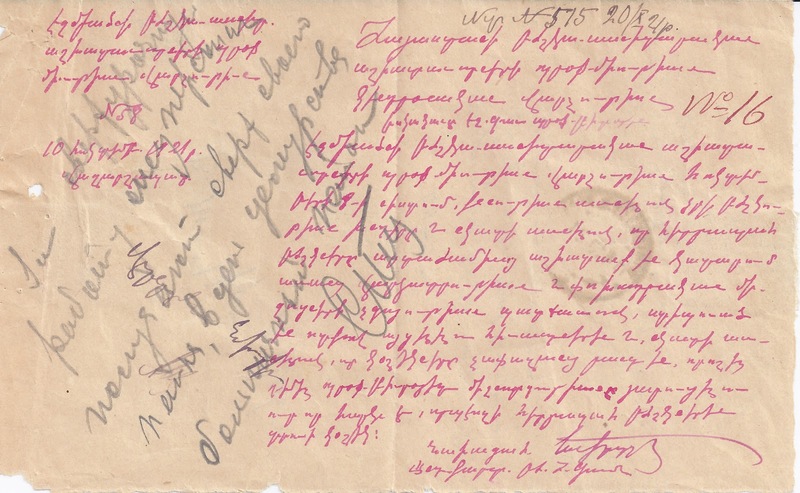 The letter is addressed entirely in Armenian, this time in purple ink, with the first word reading "Yerevan". At the bottom left of the address the No 58 is repeated with a note underneath and a faint violet seal applied to the right (and after the letter had been folded and sealed with a paper strip). The seal is inscribed in Armenian in the outer ring and in Cyrillic on the inner circle. I can't read it all but I can see the letters "S.S.R.A." for Armenian Soviet Socialist Republic and the abbreviated word "ECHM." for Echmiadzin. Then it looks as if there is the word "REVKOM" - Revolutionary Committee - with other words or abbreviations which I can't read but which someone else might be able to reconstruct or guess at. Together, the No 58 and the Seal probably gave this letter Free Frank privileges. However, at this date - October 1921 - Armenian post offices were only accepting payment in cash for letters and not using stamps (see Zakiyan and Saltikov's 1988 book for the archival evidence). 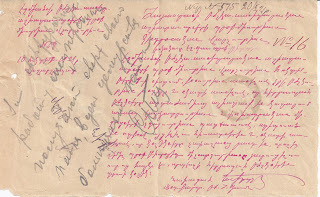 There is a short note in Cyrillic which would have been on the back of the folded letter but which is at the top of this Blog and which I can't decipher but which could include a signature. If it was a receipt for payment in cash, I would expect (from previous experience) to see a number. Finally - and this is what you have probably been waiting for - there is a double ring ECHMIADZIN ERIV 14 10 21 cancellation, in a small style illustrated in Zakiyan as Type 13 among the Vagarshpat / Echmiadzin cancels he records (Ashford does not list this cancel). 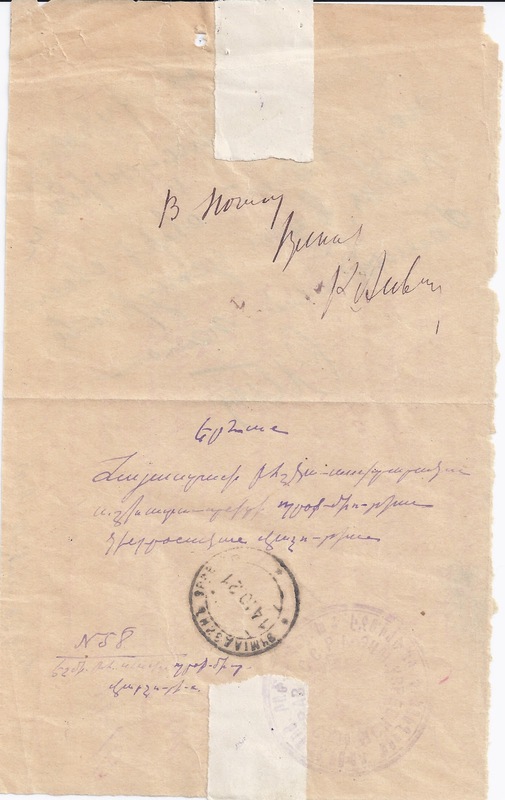 So here we have one of those rare things, a postal item from the first year of Soviet Armenia's existence. Don't expect them to look much more exciting than this one. The best I can do with the scribble is "V POCHTU V...AT" of which the first two words translate as "to(wards) the mail..." so I don't think it's a "postage received" notation. Mind you, for official mail no postage was required, as you say. What an interesting period! Has anyone ever seen non-official mail from this period?